Valdez also does work in graphic design, illustration, and photography, but caricature is his first love. He travels with a group of other artists to state and county fairs across the country, where they set up booths and draw pictures that capture a face and a person’s essence from his perspective. Valdez says he draws from the inside out rather than the more common approach of drawing a face from the outside in — that is, beginning with the shape of the face and then filling in the features. But doing that doesn’t always go over well, Valdez admits. On the rare occasion, the person posing gets offended. One dissatisfied customer pulled a knife on him. He didn’t. Customers are not required to pay for a drawing they don’t like, but Valdez says most people have enough of a sense of humor to see themselves in their caricature. He posts his work all around his booth to give customers an idea of his style. “Life is an unfinished drawing: rough in some spots but amazing and beautiful in others,” Valdez says. He calls himself the "Doodle Captain." 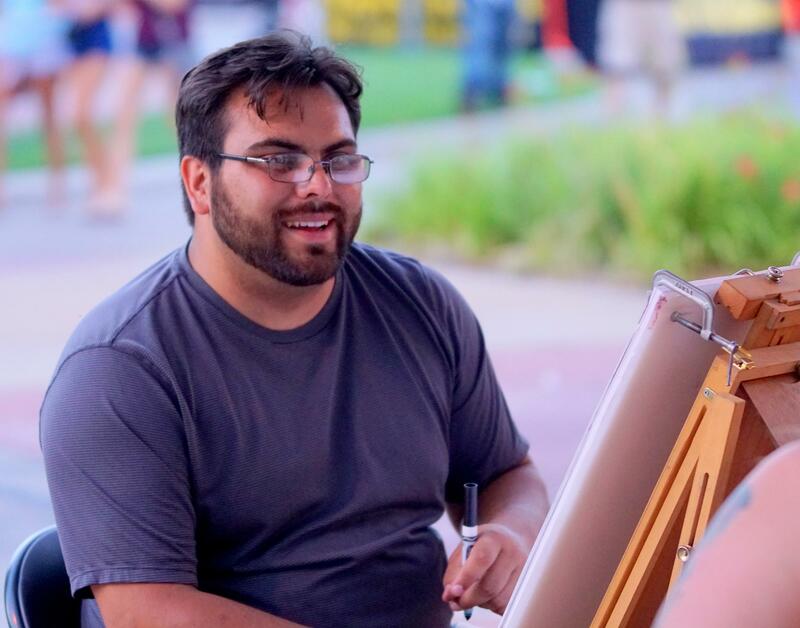 When up to a hundred people come together at a Kalamazoo brew pub, eager to take up their crayons and pencils, Mike Klok wanders around checking on all the artists-for-a-day. They've gathered for yet another monthly meeting of Kalamadoodle. A flourish of the pen and magic unfolds: handwriting that conveys a special message to the reader. No one does it better than a calligrapher. This visual art form began when scribes put the word of God on paper by hand, and it continues today in Kalamazoo. Art Beat: Just Do It! Don Desmett began his art career thinking he’d be a sculptor. But he walked away from that, feeling that he just didn’t have it in him. But Desmett did have a good eye for great art, so he became a curator instead.